Let me start by saying I’ve read all the Sherlock Holmes stories by Sir Arthur Conan Doyle, seen all the black and white Basil Rathbone and Nigel Bruce movies and Jeremy Brett BBC series from the eighties. The new Sherlock Holmes film shares the character names only with these and is recreating it as a franchise. And I thoroughly enjoyed it. 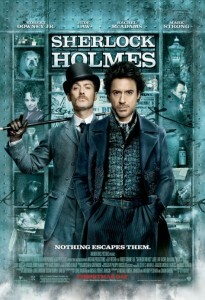 Sherlock Holmes is a new film starring Robert Downey Jr. and Jude Law as Holmes and Watson. It’s set in London of the late 19th century and focuses on Sherlock Holmes, a brilliant detective and his friend Dr. John Watson. 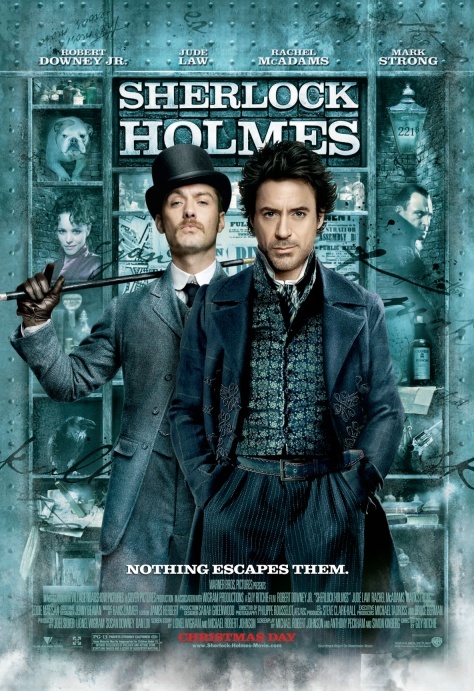 This is an action film that features Holmes and Watson as thinking men action heroes, lean and skillful. Two fight scenes in particular bring us into the mind of Holmes as he methodically plans his blows for maximum effect: it’s very catchy. We’re engaged in the methods Holmes uses and are shown how he works. The story revolves around a disgraced member of parliament who through black magic accomplishes his dastardly goals, with Holmes and Watson on his trail. Lots of mystery and a good chase with Holmes of course triumphant in the end, dispelling magic with logic. It’s a great ride and an action movie off the beaten path.